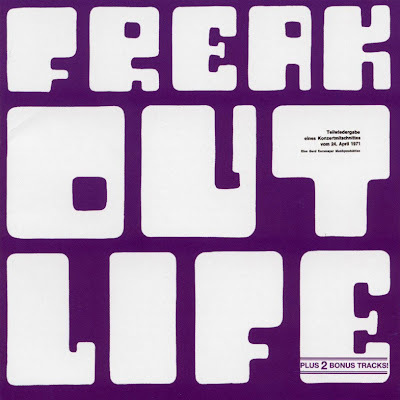 "In 1971, Freak Out from Knittelfeld in Austria, named after the first Mothers of Invention LP, released the 7" single "Jaming brother" / "Crazy colours of life" (Cosmos 2234) and the LP "Life" (Cosmos 2235), both in a small circulation of around 200 copies each. This is why the band is relatively unknown among collectors. This CD contains both the LP and the two single tracks. Garden of Delights has, as usual, taken the original cover artwork of the LP for this CD. Some critics may doubt the musical quality of this CD since eight of the eleven tracks were cover versions of songs by bands like Blodwyn Pig, East of Eden, Spirit or Mothers of Invention, but the performance was really good, with the saxophone adding a lot of originality. The LP was recorded live in Klagenfurt in front of an audience of around 1000 people on Saturday, 24 April 1971."